This darling immaculately kept apartment is in a very central and convenient location for skiing, conventions etc. Perfect for three days or three months! We moved it upstairs!! Enjoy the entire upper floor of this cute brick bungalow. 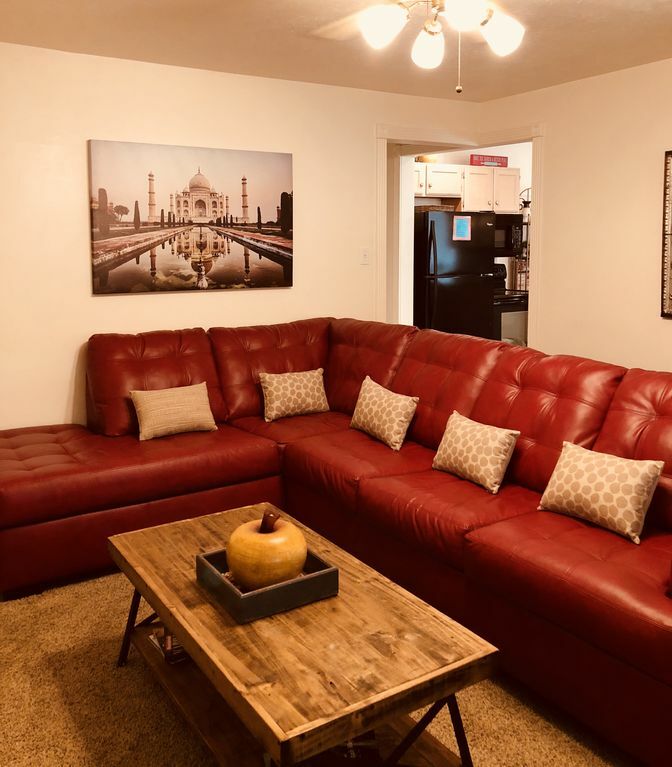 Everything you need for your short or extended visit - master bedroom with a queen bed, 2nd bedroom 1 queen and one twin, laundry, fully equipped kitchen, cozy living room with fireplace, 2 televisions, wi if, cable tv and Blu-ray too. Anything you could want in the way of shopping, dining and entertainment is just steps away in Holladay Village. Slopes and downtown less than 30 minutes, Park City 35 minutes. Easy access to convention centers. Beautiful , safe Salt Lake City suburb nestled near the base of the Wasatch Mountains. Car is recommended but not necessary. Bus stops are within 1/2 block. 6 steps required to access apartment. Check in and out is simple with the door code provided to you. You can access the apartment at any hour. This is truly a prime location central and easy access to downtown, convention centers and slopes. In addition, we have tried to think of everything to make your stay pleasant and enjoyable. We live 5 minutes away and are available and happy to help or answer any questions during your visit. Truly everything you want or need within steps . Cute, bright, clean, quiet, beautifully maintained and great floor plan make this spacious apartment a perfect fit. Brand new grocery store with deli and gourmet choices close enough to say "right outside your door." Coffee shops, restaurants, specialty boutiques, library, pharmacy, food truck park, movie theatre, children's park, hardware store, post office located within a few blocks. You'll fall in love with the charming setting that is "Holladay Village"
Holladay village is 1/4 block from the apartment with grocery, restaurants and shopping. Nicely equipped kitchen with dishes, utensils, pots, pans, kuerig coffee maker, microwave and dishwasher. We love the location, the setting of the apt and the completeness of stocking in it. Totally enjoyed our stay there. I enjoyed staying at the Holladay VRBO. I rented it for 21 days. It worked very well for my Utah ski adventure. Easy access to ski areas. A great location; short walk to a grocery store, various restaurant, coffee shop, drug store, a hardware store, and numerous other stores. Nicely decorated, with room for renters to put their personal items. The kitchen is well stocked with required implements. Very nice to have a washer and dryer in the house. Would definitely recommend this nice VRBO house. This is such a cute little house. The beds were very comfortable and it all felt very homey. We loved this home! We would definitely stay there again. Nice place. All the comforts of home. Very convenient to a lot of restaurants and several skiing mountains. We enjoyed our stay. We could only stay 3 nights in SLC - good location - easy walk to great grocery store. Nice touches provided - goodies in kitchen and thoughtfulness in bathroom - off street parking - spacious kitchen area.